MEDWAY, Mass. – Trailing by six goals at halftime and five after the third quarter, Sharon rallied to try and extend its season for at least one more round. Led by three goals from senior Matt Cancian, the Eagles got as close as two goals and had a three-on-none break that could have made it even closer. Unfortunately, the Eagles ran out of time and Medway goalie Tanner Pearl made a series of strong saves that preserved the lead as the pressure mounted. The Mustangs managed to hold on for the final six minutes and advanced with a 14-12 victory in Tuesday night’s Div. 2 Central/East first round game at Hanlon Field. The Mustangs dominated the first half and every time that Sharon got on the board Medway seemed to respond with a couple of its own. Junior Jake Tomsik opened the scoring 90 seconds into the game and that was quickly matched by Cancian, who won the face-off and raced down to score his first. Adam Dwyer came right back for Medway but Mark Bloom tied it again with a step back rip that snuck inside the far post. Tim Niklas drove into the middle to regain the lead (a lead that Medway would never relinquish) and then a long Mustangs possession ended in a Collin Kennealley goal off a back cut. Seconds later Tomsik scored with a backhand shot in traffic to make it 5-2 after the first. Josh Rotman scored his first with a shot in traffic to cut the lead to two, but Sharon mistakes helped Medway build a five-goal lead midway through the quarter. Rotman scored his second to cut the lead to 8-4 but James Anderson went 50 yards straight down the middle to answer right back and Tomsik’s third made it 10-4 at the break. Whatever was said at halftime turned the tide for the Eagles, who dominated possession in the third quarter, although they struggled to cut into the lead. Needing to find a way back into the game, Sharon looked to its senior trio of Cancian, Bloom, and Titus. Bloom scored first but three minutes later Dwyer was allowed to run straight down the middle to beat Dan Spelfogel (six saves). Craig Titus leapt and finished on the edge of the crease and Bloom picked out Titus for a man-up goal that brought Sharon within four goals. But, with a minute left in the third, Ben Steinhoff also found plenty of space in the middle of the defense to give Medway a 12-7 advantage heading to the fourth. Rotman started the comeback with a lefty shot on the run and then Cancian quickly added another with a shot into the bottom corner. Steinhoff got one back straight off the draw, but Cancian scored a man-up goal to make it 13-10 and then won the draw and came down to score with an overhand shot to the corner. Anderson again found a lane in the middle to get an important insurance goal for the Mustangs, but Rotman bullied his way to his fourth goal of the game to make the deficit just two with 6:15 to play. In the fourth, Jack Lesser twice hit the post and Cancian and Rotman both saw Pearl come up with big saves to rob them of sure goals. Lesser also had a chance in transition to cut the lead to one, but his shot on the break went wide and Pearl chased it down quickly to get Medway possession. “I can’t even think about the amount of saves he made with just the tip of his toe or something like that and yeah if we buried three more of those then we’re talking about something else,” DeSisto reflected. It was not the way the first-year coach was hoping to end his season but with only three seniors on this year’s roster, the Eagles have plenty of promise for the future. “I’m excited,” said DeSisto. “We’re losing three unbelievable players…but we had a really young team this year. SHARON, Mass. – Heading into halftime of Tuesday morning’s game, Sharon had answered back from a Medway run and had managed to tie the game on Mark Bloom’s third goal of the half. The momentum was with the home team at the break, although the Mustangs started the third quarter man-up thanks to a penalty at the halftime whistle. Medway scored on that man-up situation, then a minute later added a second. Then it was another EMO goal for the Mustangs to make it 10-7 and then another on a locked in, two-minute penalty. When the dust settled on the third quarter, Medway had broken open a tied game and taken a six-goal lead. “In the first half, we played with a lot of heart and a lot of intensity and I’m not really sure what it was…they popped in a couple of quick ones and the wheels kind of fell off,” said Sharon coach Peter DeSisto. The third quarter run was enough to hand Medway a 15-9 road win and continue Sharon’s struggles at the start of the season. The Eagles showed resiliency in the first half. Bloom scored a pair of goals in the opening three minutes of the game to give Sharon a lead and Matt Cancian scored the first of his three goals to make it 3-1, but then Medway answered right back with five straight to lead 6-3 with 4:38 left to halftime. The Eagles did not panic and started chipping away at the lead. Sophomore Brett Litner received a pass from Craiog Titus in the heart of the Medway defense, spun, and scored to make it 6-4. 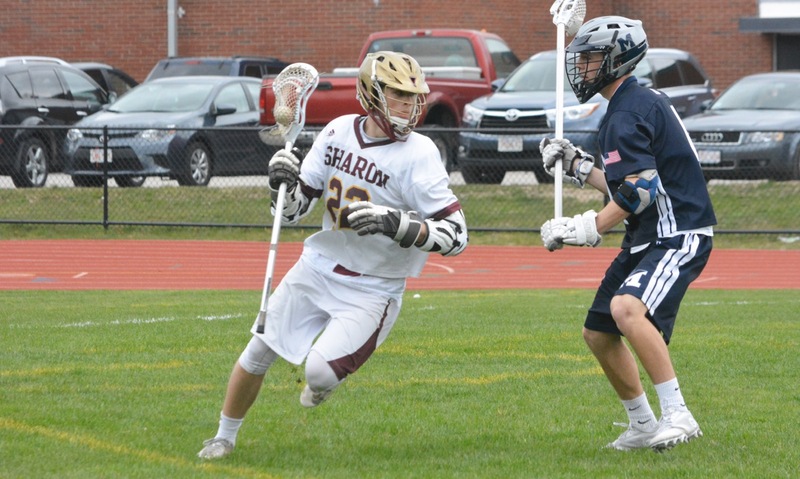 Thirty seconds later, Cancian scooped a ground ball in the attacking zone and drove at the cage before finishing past Medway goalie Tanner Pearl. With 1:09 left in the half, Titus had his shot blocked by a defender in front, but the ricochet took it right to Cancian and the senior fired it home to tie the game. Evan Rackliff regained the lead for Medway but again Sharon had a response with Bloom taking a pass from Spencer Hall and taking his time to line up a rip and make it 7-7. Coming out of the break with an EMO, Medway took its time and scored with three seconds remaining on the penalty. 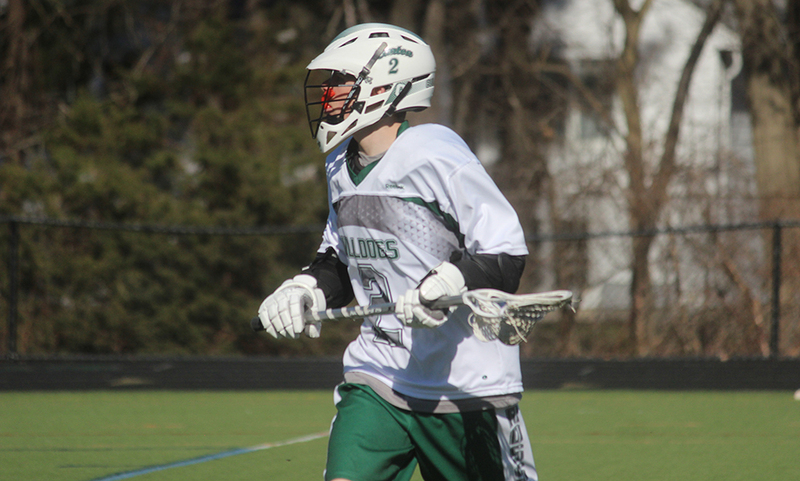 Junior Jeffery Wenzel then added a third quarter hat trick to turn the lead from one goal to four. After a 2:00 penalty against the Eagles, Ben Steinhoff added his second of the quarter to make it 12-7. Offensively, the Eagles started to grow impatient as the deficit widened. Cancian, Bloom, and Josh Rotman continued to get into decent positions but were not able to beat Pearl from distance. As the Mustangs continued to tack on goals, Sharon’s offense grew increasingly one-on-one. The defensive unit, including freshman Coleman Loftus, sophomore Zach Reingold, junior Jared Zunenshine, and freshman LSM Sam Spencer, lacks varsity experience and the Medway attack took advantage. Medway added a goal late in the third and Jake Tomsik turned and beat junior goalie Dan Spelfogel (six saves) to make it 14-7 early in the fourth. Titus scored with a lefty rip to end the run for the Mustangs, but Ross Cooperstein came right back with another goal. The Eagles would wrap up the scoring with 1:59 remaining on arguably the prettiest goal of the day, even if it was only a consolation. Rotman played the ball to the edge of the crease and Jack Lesser took a quick touch before depositing a low-angle, behind-the-back shot past Pearl. Sharon (1-4) will try to get on track on Thursday against Taunton. Attleboro, 9 @ Sharon, 0 – Final – Senior Tyler Stowe struck out six in six innings of work, allowing just two hits to earn the win. Will Carter went 2-2 with two RBI and a pair of stolen bases while Pat Collins also added a pair of hits and scored two runs. Head coach Matt Bosh noted the strong defense from Nate Tellier at shortstop. Canton, 5 vs. Fairhaven, 3 – Final – Griffin Jerrier went the distance on the mound, striking out one and issuing just one walk to get the win. At the plate, Jerrier was 2-3 with an RBI and a run scored. Kevin Powers was 2-3 with a run scored and Joe Peccia was 2-3 with two RBI and a run scored. Jim Jenkins came through with a big hit in the third inning, knocking in a run for the Bulldogs. Foxboro, 14 @ Dedham, 16 – Final – Jesse Galanti and Darren Kelly each had three hits for the Warriors and A.J. Cavossa added a pair of doubles and drove in three runs. Milford, 1 @ Mansfield, 3 – Final – Jared Menzer tossed a complete game, scattering six hits and striking out four to earn the win for the Hornets. Jake Tryder went 2-2 with an RBI double and a run scored and Tyrone Pascual was 1-3 with an RBI triple and a run scored for Mansfield. North Attleboro, 10 @ Central Catholic, 8 – Final – North Attleboro scored three runs in the top of the seventh inning to break open a tie game and get the win. Brian Poillucci led off with a triple and scored on a single from Ridge Olsen. Brian Kleczkowski reached on a fielder’s choice and pinch runner Zach Levitsky advanced to second on a walk to Brett Cloutier. Pinch hitter Nick Pedro brought Levitsky home with a single and Bryan Harris plated Clouter with a double. Andy Katch tossed a complete game without issuing any walks, striking out five to earn the win. Sophomore Zach DeMattio paced the offense with three hits and four RBI while Poillucci also had a double in the game. Taunton, 5 vs. Durfee, 4 – Final – Charles Hearrold III did it all for the Tigers on Tuesday morning. Hearrold III picked five innings, scattering five hits while allowing just one run. At the plate, he had a pair of hits and a pair of RBI. In the bottom of the seventh, he came home to score the winning run on a wild pitch. Foxboro, 4 @ Dedham, 1 – Final – Kelly Fisher went 3-3 with a pair of RBI for the Warriors and Emma Rohan threw a complete game, allowing only three hits and no earned runs. Stoughton, 16 @ Milton, 3 – Final – Stoughton had 19 hits in the first game of the doubleheader, including a 3-3 day from senior Sam Tullis, who had a homerun, three RBI, and scored four runs. Nicole Bodette added three hits and six other Black Knights had a pair of hits apiece. Gina Carafa picked up her first win, allowing two runs on three hits and striking out five over four innings. Stoughton, 6 @ Milton, 3 – Final – Freshman Karly Estremara began the game with a lead-off homer. She finished 3-3 on the day and a single shy of the cycle, while scoring three times, and recorded her fourth straight multi-hit game. Sam Tullis had three hits in both games of the doubleheader and Shannon Flaherty threw a compete game, allowing two earned runs and striking out six Milton hitters. Franklin, 14 vs. Masconomet, 3 – Final – After leading by just a goal at the halftime break, the Panthers pounced in the second half. Franklin held a 4-3 lead at half before winning the second half 10-0. Senior Austin Kent had six goals and two assists and sophomore Eric Civetti scored five goals with one assist. Connor O’Rourke made seven saves in net while freshman Jacob Alexander had another huge game at the face off X. King Philip, 8 vs. Hopkinton, 7 – Final – King Philip trailed for the majority of the game but took the lead with 1:09 left in the game behind a goal from Anthony Truini on an assist from freshman Collin DeVellis. Hopkinton leveled the game with 42 seconds to play but John DeLuca scored the game winner for the Warriors with 20 seconds to go off an assist from Harry Fallon. “I’m really proud of the way our team responded after losing tough game against Feehan to come back here and play a strong game against a strong opponent,” head coach Jacob Kravitz said. Sam Agricola had three goals and an assist for KP while Tim Watson scored once and had two assists, Fallon had a goal and an assist, Truini and DeLuca each scored once and Conor Khung came up from the defense to score a goal. 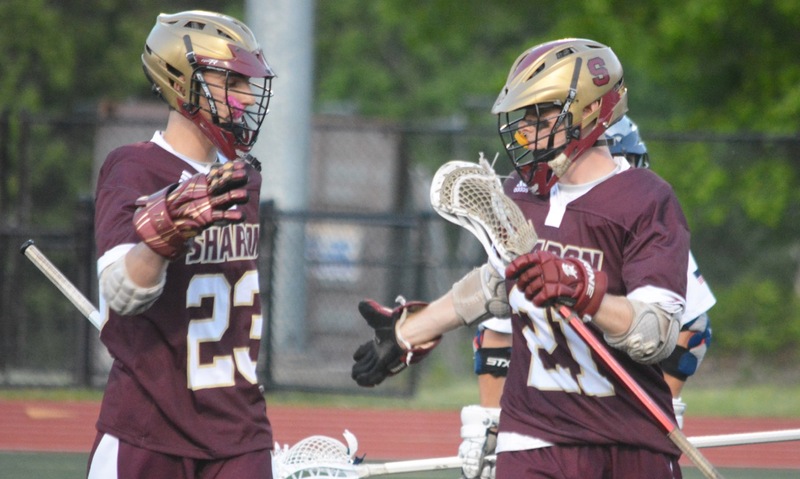 Sharon, 9 vs. Medway, 15 – Final – Matt Cancian and Mark Bloom each scored hat tricks for the Eagles in the first half. Medway scored the opening seven goals of the second half to break open a 7-7 tie at halftime. Brett Listner, Craig Titus and Jack Lesser also scored for Sharon and Dan Spelfogel made six saves. Taunton, 2 @ North Attleboro, 17 – Final -Erin Holley led the way for the Rocketeers with six points, including two goals and four assists. Hana Caster and Mackenzie Rosenberg each scored hat tricks for North. Abby Kingman scored both goals for the Tigers and goalie Lorna Li made 16 saves in the loss. Mansfield @ Holliston, 11:00AM – Postponed to TBD. Taunton, 3 @ Norwood, 0 – Final – After dominating the first game, Taunton won a close second game and completed the sweep over Norwood in the third game. The Tigers won 25-12, 26-24, 25-18. Lance Law had 10 kills, three blocks and two aces and David Perry added eight kills and a pair of blocks. Lens Esquil contributed a strong all around game with 15 service points, five kills, four digs, three aces and three blocks for Taunton. SHARON, Mass. 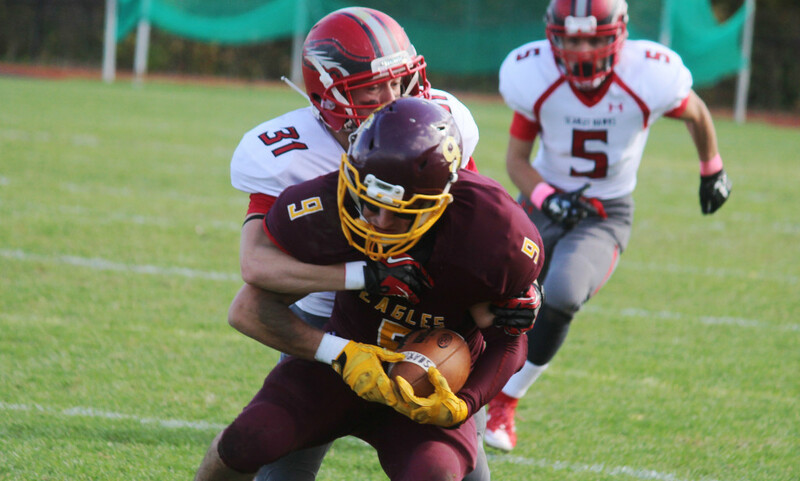 – A week after giving up 42 points to league leading Foxboro, the Milford defense came into Saturday afternoon’s game at Sharon on a mission to give the Hawks a chance to play next week for a Div. 3 Southwest tournament berth. Mission accomplished for the Hawks (3-3, 2-2), who forced three turnovers (two interceptions and a fumble) and held the Eagles (2-4, 1-3) scoreless until the final three minutes of the fourth quarter. Milford took advantage of the turnovers to pull out a 17-7 win that keeps the Hawks in the hunt for a spot in the playoffs. Sharon took its opening possession all the way to the Milford 22. 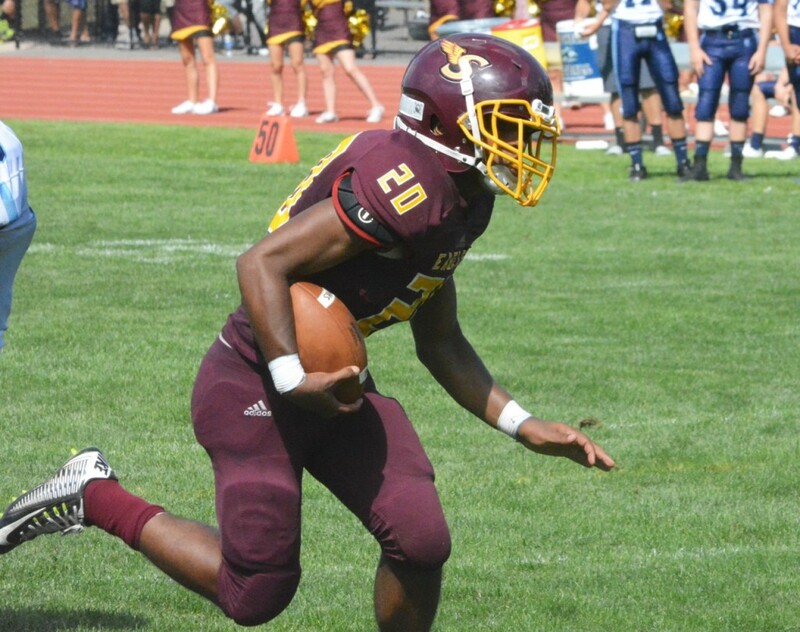 Junior running back Juvan Elisma carried the ball nine times on the drive for 24 yards and senior Rob Bayha (16-25, 197 yards) completed all three of his passes, but the Eagles could not finish and were stopped a yard short on fourth down. Milford immediately marched downfield to open the scoring. Zach Lanzetta (9-12, 60 yards) was 3-3 on the drive, including an 11-yard completion to Leonard Moronta to the Sharon 16, and also ran for 12 yards. Junior Blake Hill had four carries for 31 yards and punched it in straight up the gut from four yards out. Sharon’s second possession ended in a fumble by Elisma that was recovered by Milford’s Alec Salamone at the 25. But, the Eagles defense held strong and, with help from a holding call, forced Milford to punt. Once again the Eagles moved the ball and got into Milford territory. Bayha continued to be accurate with his underneath passes and spread the ball around to four different receivers, but he tried to go up top and underthrew his receiver down the middle and was picked off by Ryan Nesta at the Milford 33. The Hawks marched 67 yards in nine plays, including a 23-yard completion to Hill that converted a first down, even with a block in the back penalty down the field. After an eight-yard run by Shapel Feester to the four, Lanzetta completed the drive with a four-yard keeper. On Sharon’s first possession of the second half, the Hawks defense again made a play to end a drive that had Milford on its heels. Hill made a leaping, twisting interception on a pass deep down the middle to get the ball at the Hawks 20. In the fourth quarter, Sharon was forced to go for it on fourth down at its own 24 and turned it over on downs. Four plays later Sean Lehane kicked a 33-yard field goal that put the Hawks ahead 17-0 with 3:25 left and seemingly wrapped up the win. The Eagles needed a big play and, after narrowly missing on several deep throws, finally found the connection with Bayha hitting Craig Titus in stride on a post route for a 64-yard touchdown that cut the lead to 17-7 with 3:01 left. The Hawks ran out the clock and gave the ball back with only a few ticks left on the clock. Sharon will also be facing one of the three teams currently tied for the Davenport lead when it hosts Canton next week. 2nd Quarter: (M) Blake Hill 4 yard rush, Sean Lehane XP; (M) Zach Lanzetta 4 yard rush, S. Lehane XP. 4th Quarter: (M) S. Lehane 33 yard field goal; (S) Rob Bayha 64 yard pass to Craig Titus, Josh Rotman XP. North Attleboro, 2 vs. Durfee, 4 – Final – Yezan Ismail and Matt Coscarella each scored a goal while Leo Charlebois had an assist for the Rocketeers. Oliver Ames, 4 vs. Brockton, 1 – Final – Oliver Ames junior Francesca Calabraro netted her second hat trick in as many days for the Tigers while Jackie Mills also scored for OA. Julia Roy had a pair of assist for OA, while Erin Fitzgerald and Delaney Benton each had one. Milford, 2 vs. Hopedale 1 – Final – Jess Palmer and Elena Dello Russo scored the goals for Milford, scoring the Scarlet Hawks first win over neighboring Hopedale for the first time in over a dozen years.